Okay… Day 8 post is a lengthy one since we packed so MUCH on ONE day that I hurt my ankles by the end of the day 😦 So, I divide our adventure into 2 parts. The first part will be about our trip to Vatican City (St. Peter’s Basilica and Vatican Museum) and on the second part post, I’ll share our exploration at Colosseum and Roman Forum. We woke up pretty early on our 2nd day in charming Rome. We planned to line up for Vatican museum as soon as it opened since most resources said that this is the most popular attraction in Vatican after St. Peter Basilica. From our apartment (close to Piazza Navona), we walked 15-20 minutes along the Tiber river. It was raining the night before but luckily, the sun showed up brightly in the morning that made our walk toward St. Peter’s Square so pleasant. We crossed the river toward Corte di Cassazione (Palace of Justice) and passed Castel Sant’Angelo with the beautiful bridge decorated with statues on both edges. 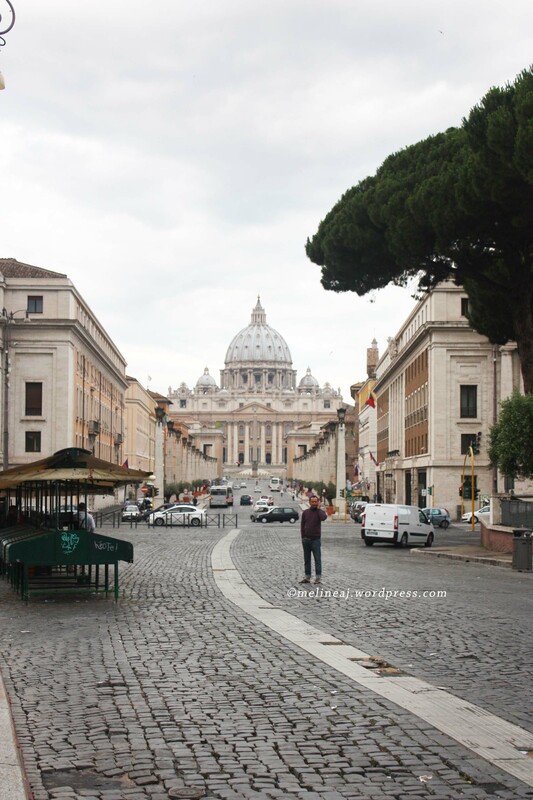 When we arrived at St. Peter’s Square, some tourists were already taking picture at the front. 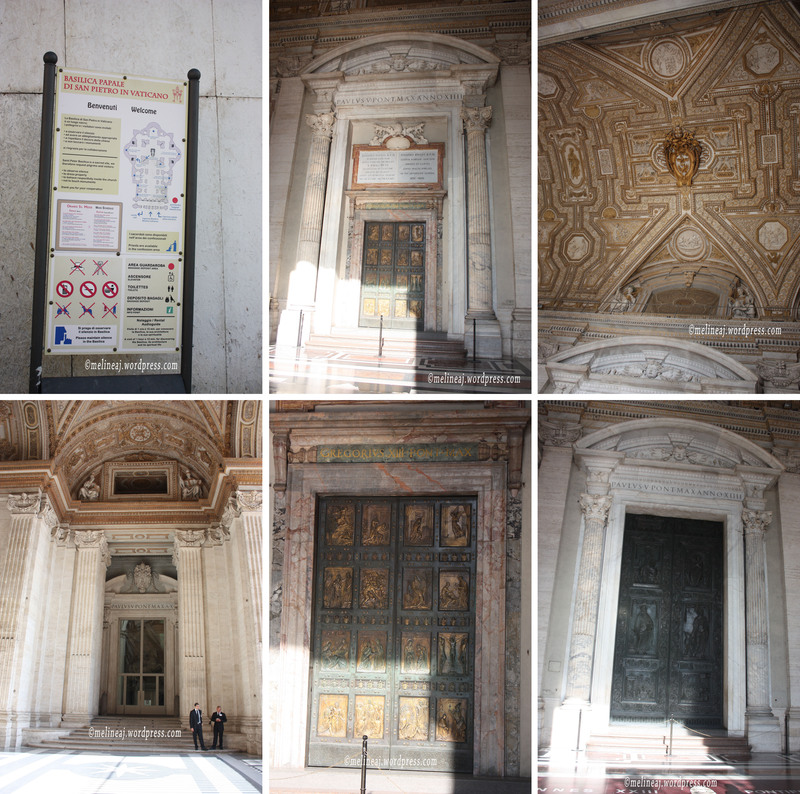 We looked for a sign for Vatican Museum, but we couldn’t find it, so we decided to visit St. Peter Basilica first. The entrance for Basilica is FREE! 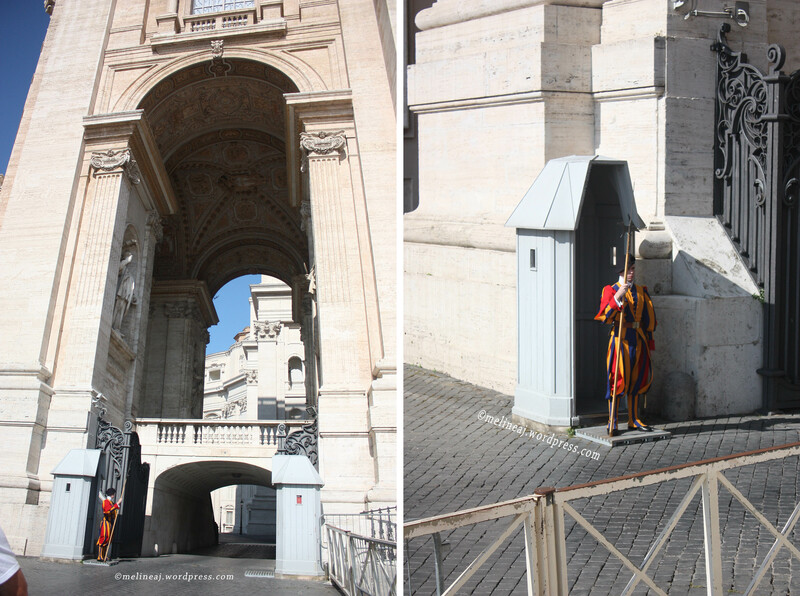 The security check for entering the Basilica is at the west side of the pillar. Luckily, we didn’t have to line up that long to passed the scanner and metal detector.Following the common rule entering church in Italy, NO shorts & tank top (exposed knee & shoulder) are allowed! There are security personals who will stop whoever breaking the rule and ask them to cover the exposed knee and/or shoulder. As soon as we enter the basilica, we lost for words! The exquisite ornaments in the church were not there to glamorize the church itself but instead it creates a sacred ambience that makes us felt humbled and wanted to pray. 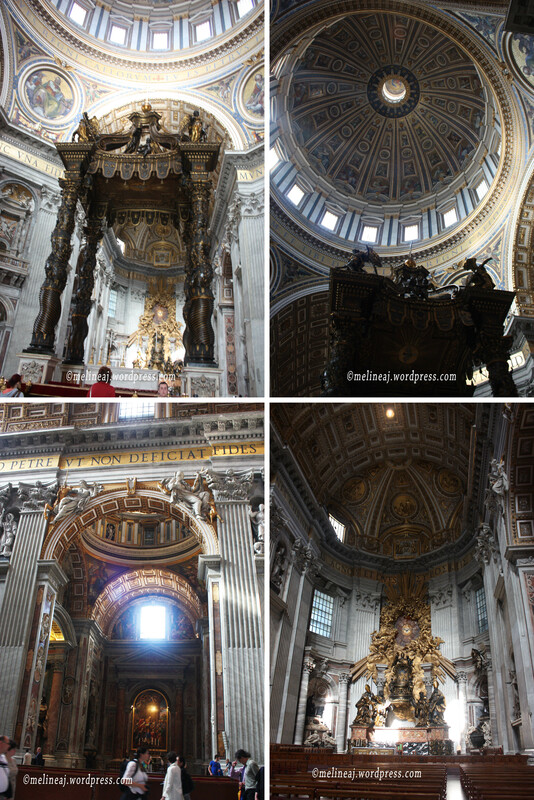 St. Peter’s Basilica is the biggest church that we’ve ever visited. 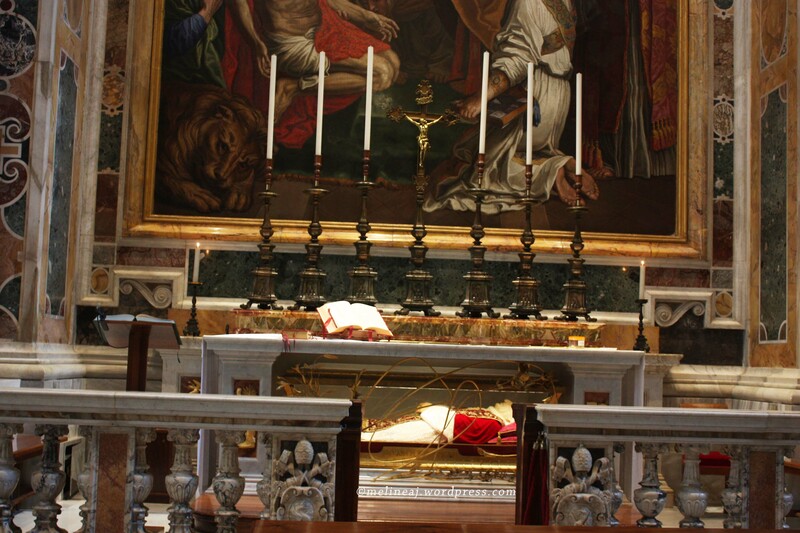 Since this basilica is actually a functioning one, some places are actually opened for confession and prayer. However, the securities were super strict and they didn’t allow any tourists (who just want to take pictures) to enter the sacred area. Some other area are restricted to groups – we saw a lot of young priests or nuns who had access to some of these area. Other area, such as the dome is not free. The ticket to go up by elevator & stairs is you have to pay €7 or if you’re willing to go up all the way by stairs, you can pay for only €4 (we skipped this). We spent a good amount of time to take picture inside and admiring the amazing details of the decoration inside. Afterward, we asked one of the guard for the direction of the Vatican museum. I must admit that the guard looked so scary and I was ready for him to ignore me. To my surprise, he was very kind to give a thorough direction of the museum from where we were! So, when you exit the Basilica from the east side (left side facing the square), walk along the Vatican wall. Before even turning to the corner of Vatican wall, we saw a super long line up for the entrance of the museum! Actually, you can skip the long line up by buying official ticket for €20 at a shop near the post office just before exiting the square (on the right hand side). Another alternative is that you can buy an advance ticket at Vatican museum website but the ticket will be more expensive (€20) due to pre-sale charge than if you buy it on site (€16). One thing to note: there were lots of people claiming from certain tourism agencies that offered an overcharged ‘skip the line’ ticket! We saw this from TV show and these people were actually scamming tourists! They claimed that they offered guided tour which is a LIE!!! 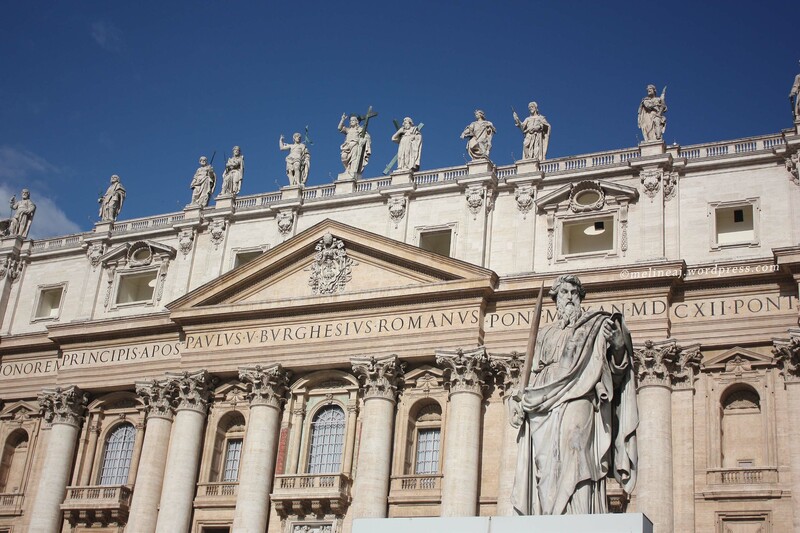 Some even offered to have guided tour to Vatican Garden – which is actually only available by advanced online booking for €32 (full price ticket €16 + obligatory earphone €1.50 + obligatory reservation fee €4 + obligatory guide €10.5). This usually fills up pretty fast so if you really want to see the garden, book months in advance for your preferred slot. We lined up for about an hour before we passed the security check and bought the ticket. The bad thing about lining up in Europe – compared to North America – was that there were lots of rude people who tried to jump in when we were too slow to move up the line! Grrrrr…. Since there were only 2 of us, some people tried to jump in front of us from left & right, so we have to blocked the path with our bodies hahahah…. Once we were inside, the ticket booth is located on the 2nd floor after we passed the security check. 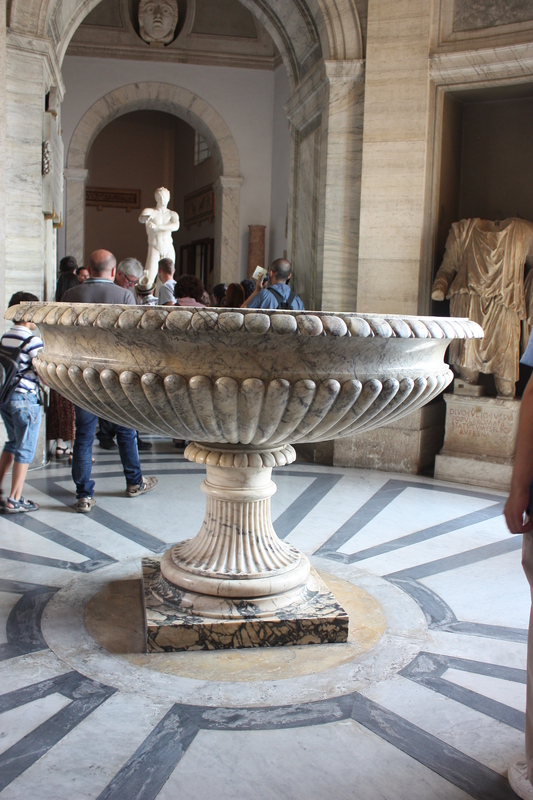 Vatican Museum is a HUGE museum with lots and lots and lots of artifacts. So, wear your most comfortable pair of shoes! The museum map is available for free and there is short itinerary available for those who want to skip the artifacts and can’t wait to see the Sistine Chapel. And yes….., the Sistine Chapel is at the END of the tour! They’re truly saving the best for last. We chose to tour the whole museum, i.e. took the long itinerary one… and it’s really really a LONG one hahahah…. We started off with visiting the courtyard. We crossed the courtyard, Cortile del Belvedere with the Fontana della Pigna (the bronze pine cone), to enter the other side of the building. 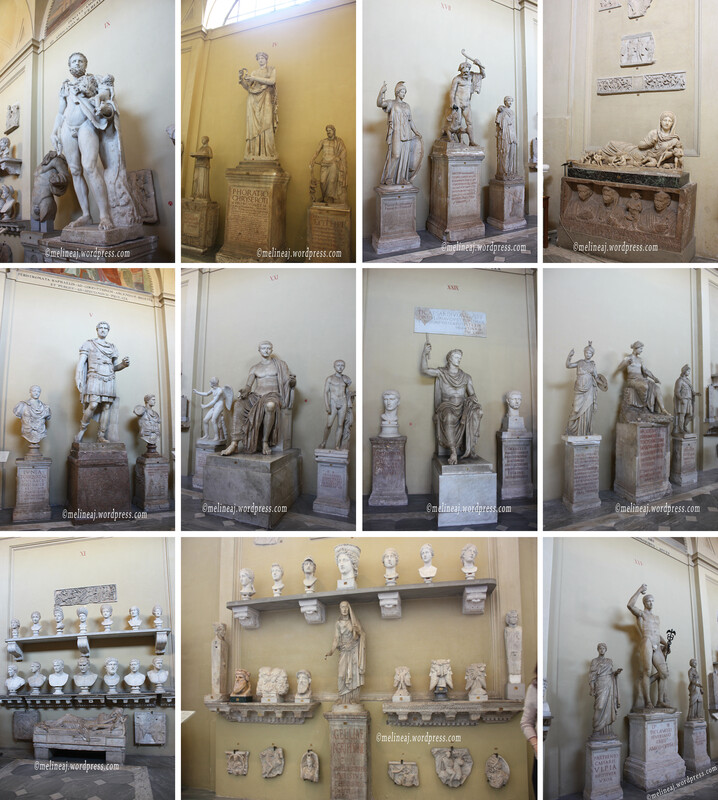 The east side of the first floor, Museo Chiaramonti, has rows of old sculptures of Roman gods. On the west side, there’s a stair with beautiful ceiling leading to the 2nd floor. On the second floor, we entering the Museo Pio Clementino area by passing the Square Vestibule and Cabinet of Apoxyomenos. 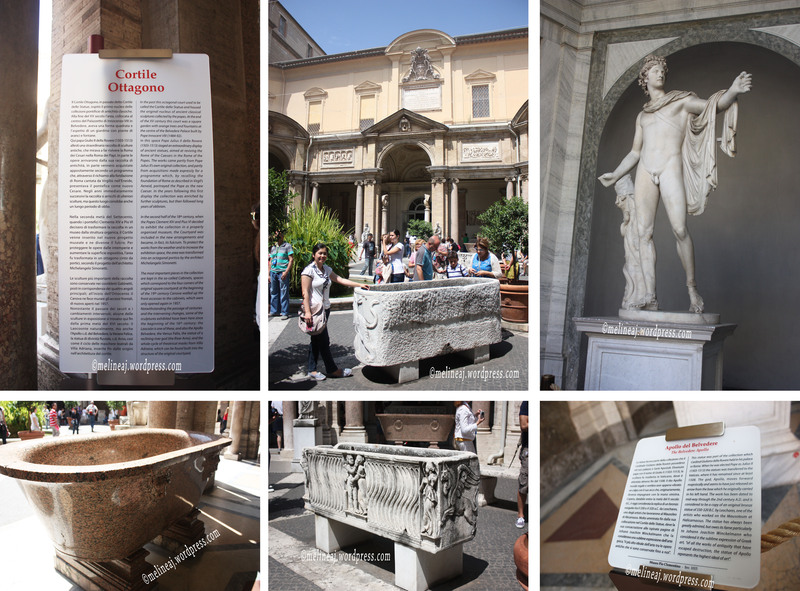 Next, we explored the Octagonal Court (Cortile Ottagono) that was surrounded by big marble bathtubs and more statues under the covered circular porch. 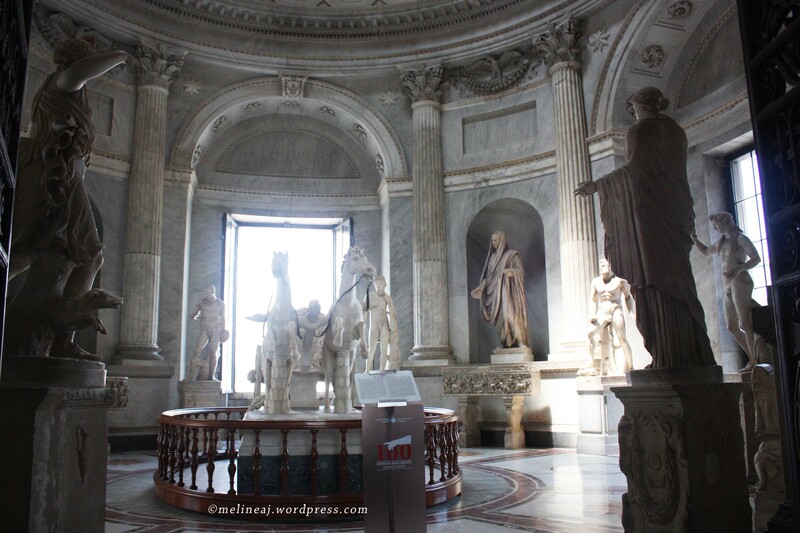 Among the artifacts, the famous statues are Apollo Belvedere and Laocoön. According to the myth, Laocoön was the priest who warned Trojans about the horse given by the Greeks. 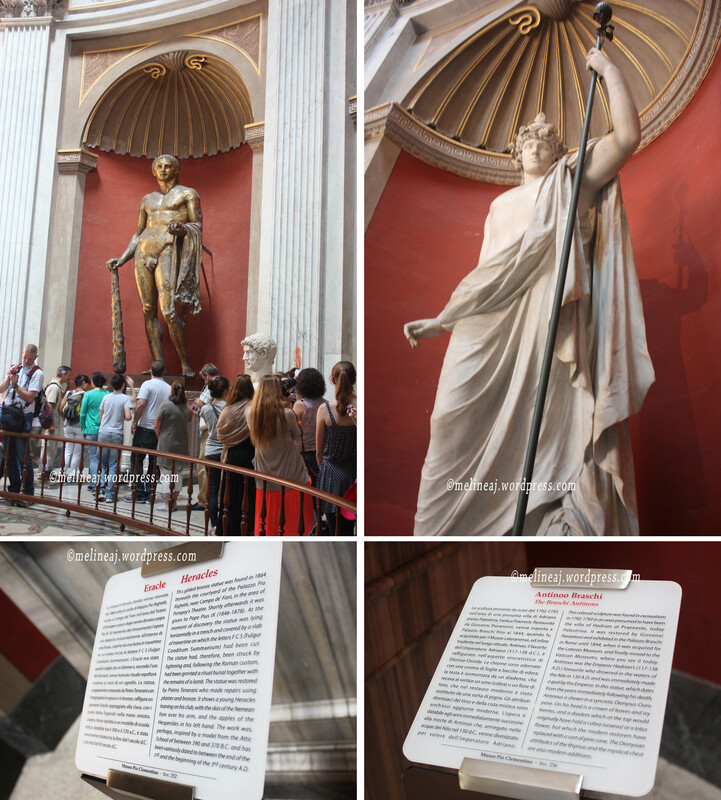 The statue in the Vatican Museum depicts the punishment in which Laocoön and his sons were strangled by the snakes sent by Athena. 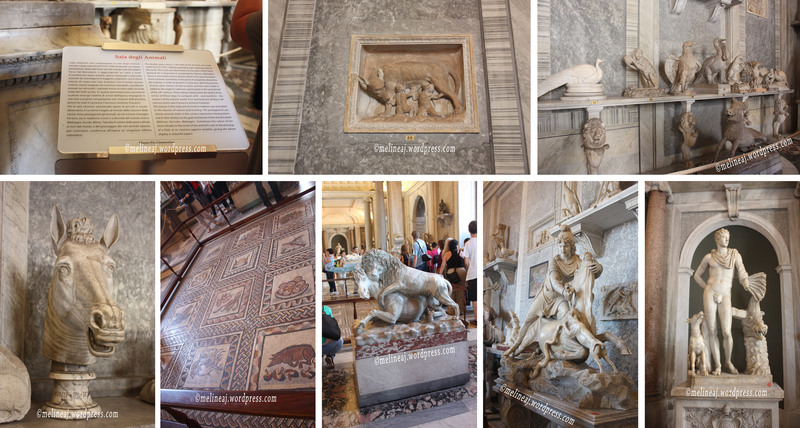 Continuing our tour, we entered Hall of Animals (Sala degli Animali) that houses lots animal sculptures and some beautiful mosaics. The details on each sculpture are really impressive! I saw the 3D sculpture of the Rome legend: the sons of God Mars, Romulus and Remus, suckling on female wolf after they were abandoned. Next to Hall Animal, there was a section of the room that was closed to public. This area was Gallery of Statues and the Hall of Busts. 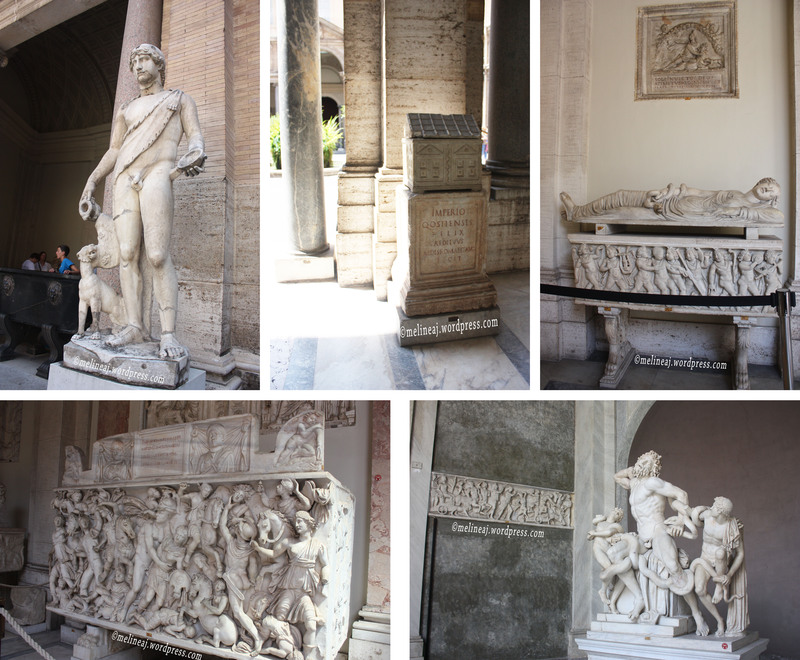 Some marble sculptures with impressive details and curve! Afterward, the crowds seemed to walked slowly at Hall of Muses. 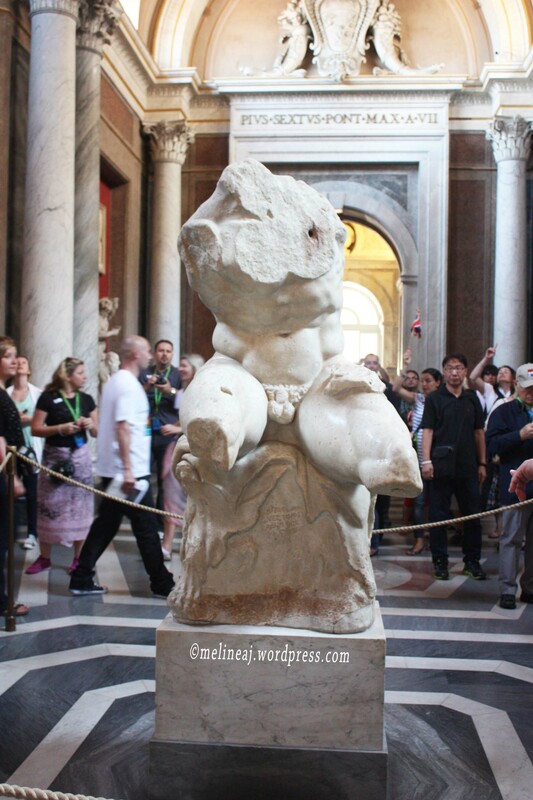 They took turn to take a picture of the Belvedere Torso. 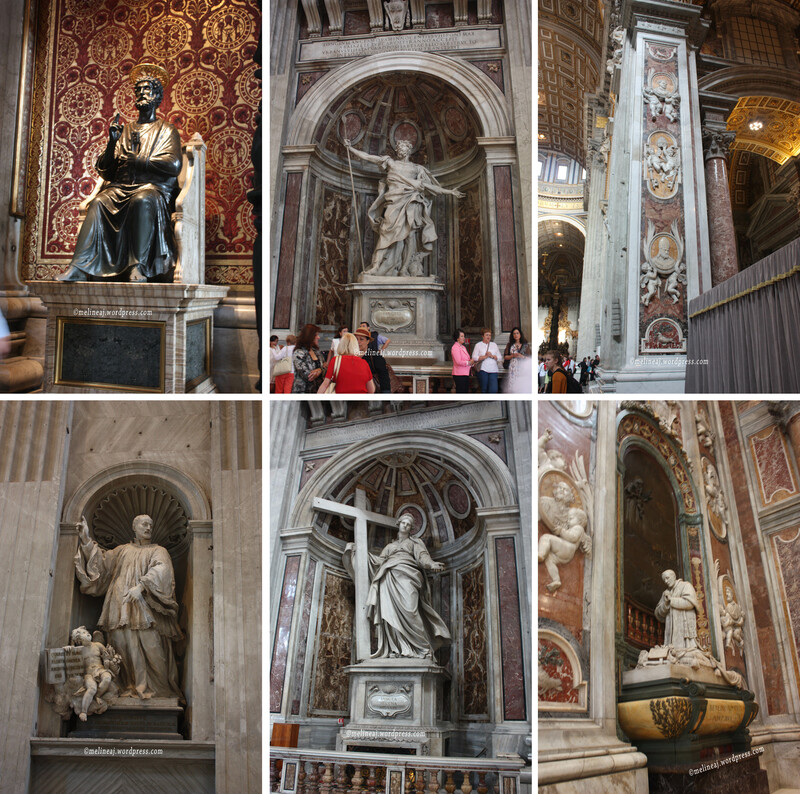 The broken sculpture was believed to be the inspiration of Michelangelo while painting the figures in Sistine Chapel. We then slowly walked toward The Round Hall. At the centre of this hall, there’s a huge red porphyry basin. 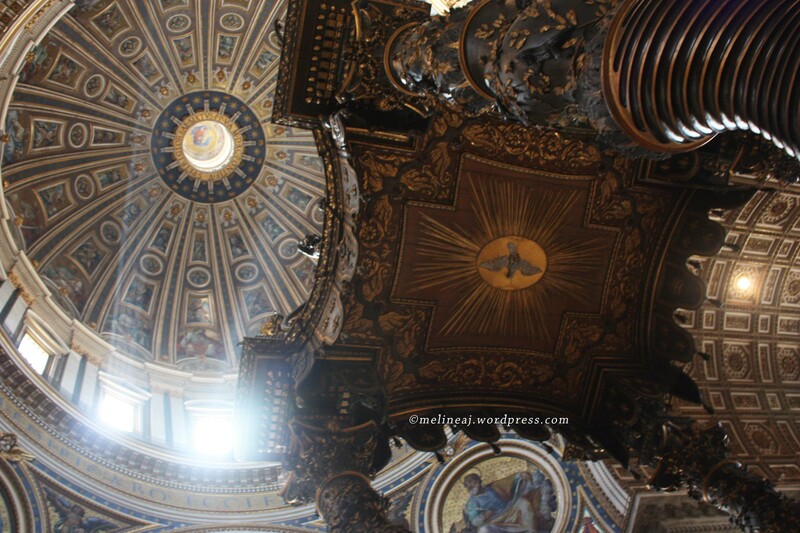 When you look up to the ceiling, it resembled the ceiling dome of Pantheon. This round hall is surrounded with 9 statues – if I counted correctly – that includes the famous bronze Heracles / Hercules statue. 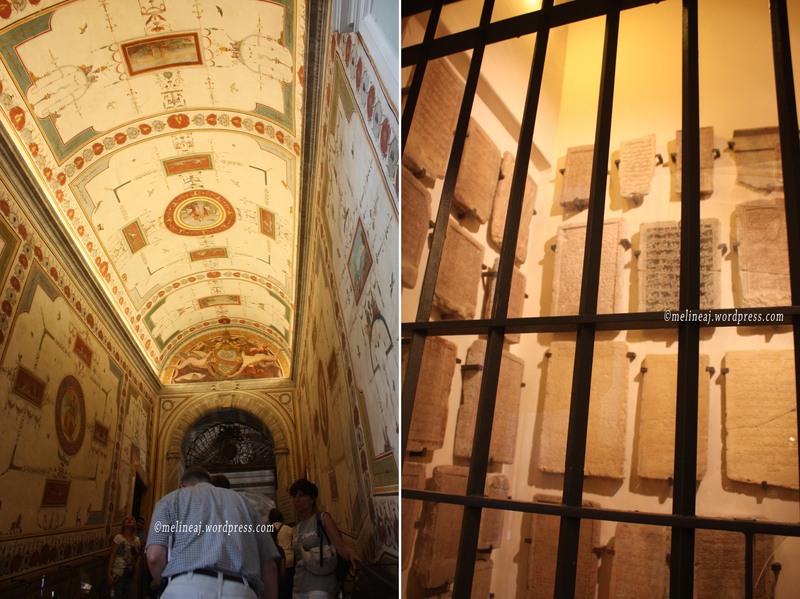 Exiting the hall, we walked into the Greek Cross Hall that houses the Sarcophagus of St. Helena (mother of Constantine the Great) and Sarcophagus of Costantia. 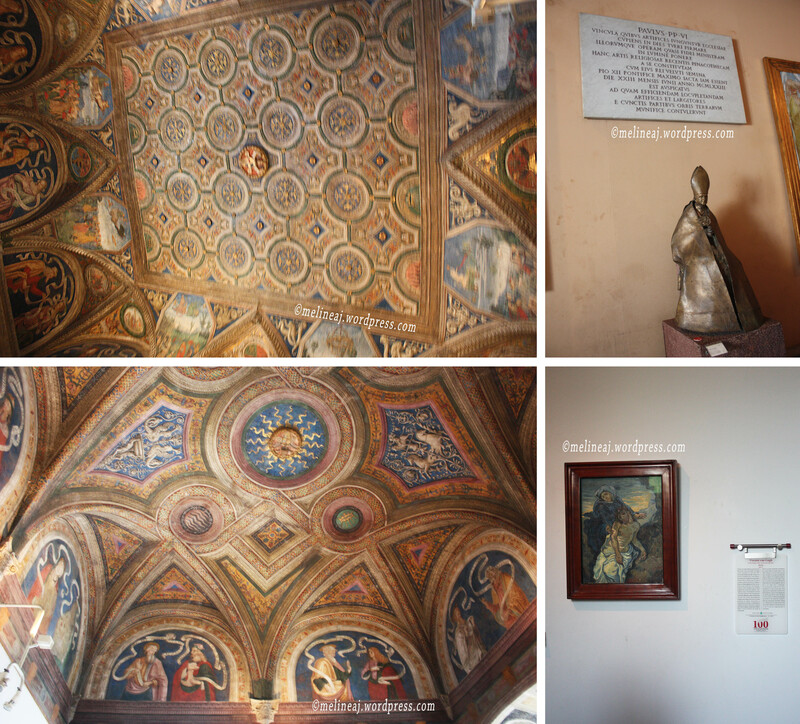 Before going to 3rd floor, we entered Museo Gregoriano Egizio, a small room on the left of the staircase. This area displayed ancient Egyptians artifacts including a real mummy! By the time we reached the end of the room, we actually went back to the stairs entrance of 2nd floor. 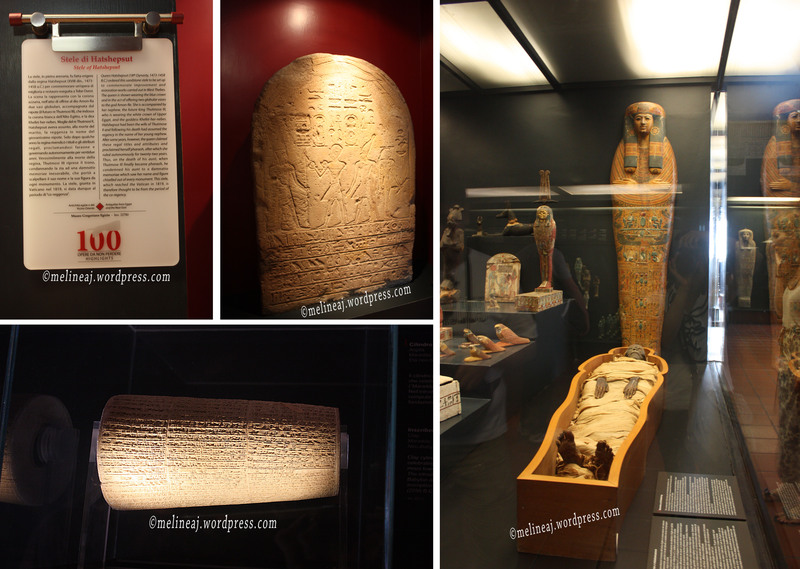 Left top: Stele di Hatshepsut; Left bottom: cylinder seal; Right: a REAL mummy! Left to Right: Reconstruction Of The Canopus Of Hadrian’s Villa, a gold seal, statue of Ibis, statue of Anubis. When we reached the third floor of Vatican museum, we peeked at House of Chariot (Salla della Biga) at the left side near the stairs. This small room houses a two horses chariot that was made from marble. We continued our tour toward Galleria dei Candelabri. We were just amazed with the gorgeous ceilings! This area displayed more and more Roman artifacts and gods, such as Artemis. 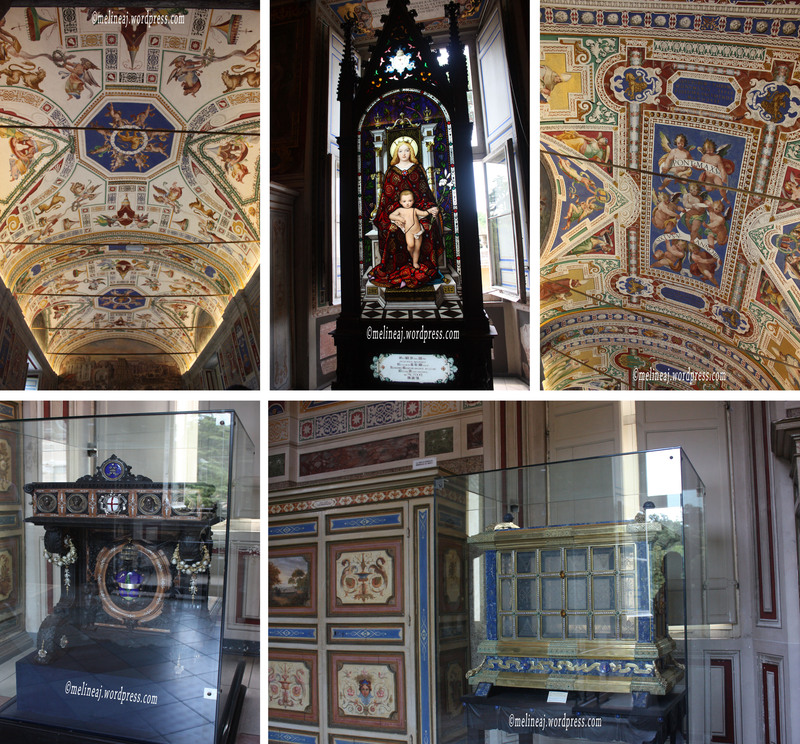 The next area was The Gallery of Tapestry (Galleria degli Arazzi) that showed a variety of tapestries and pope artifacts. 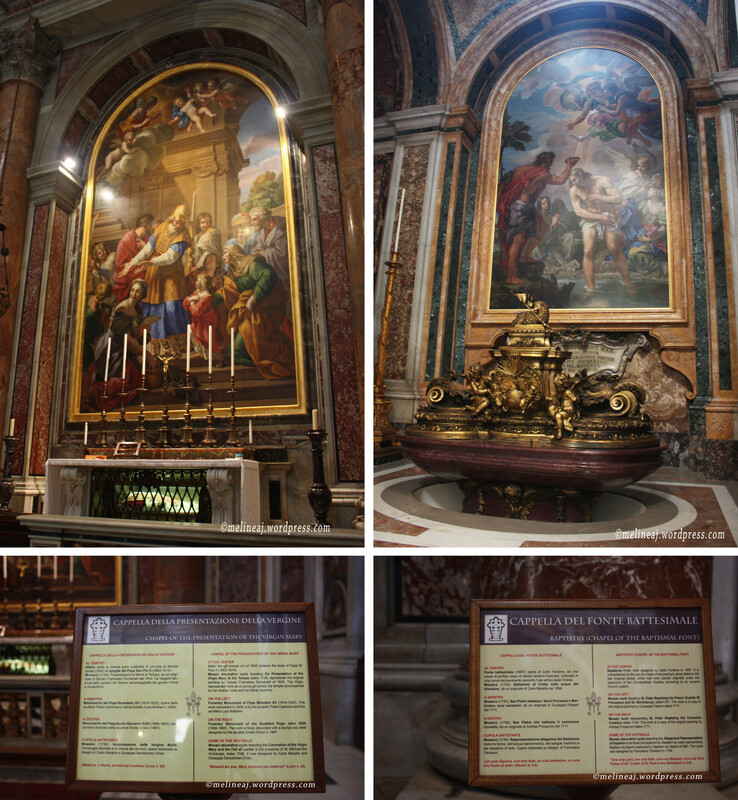 Some of the tapestries depict the biblical story, such as the resurrection of Jesus; while the others reflects the Roman culture and the Pope. The following hallway is The Gallery of Maps (Galleria delle Carte Geografiche) that displayed the maps of different regions of Italy. However, some parts of the maps were closed due to restoration work, so we didn’t really the full series of the paintings. Next, we walked through Apparmento di San Pio V showing a beautiful tapestry. 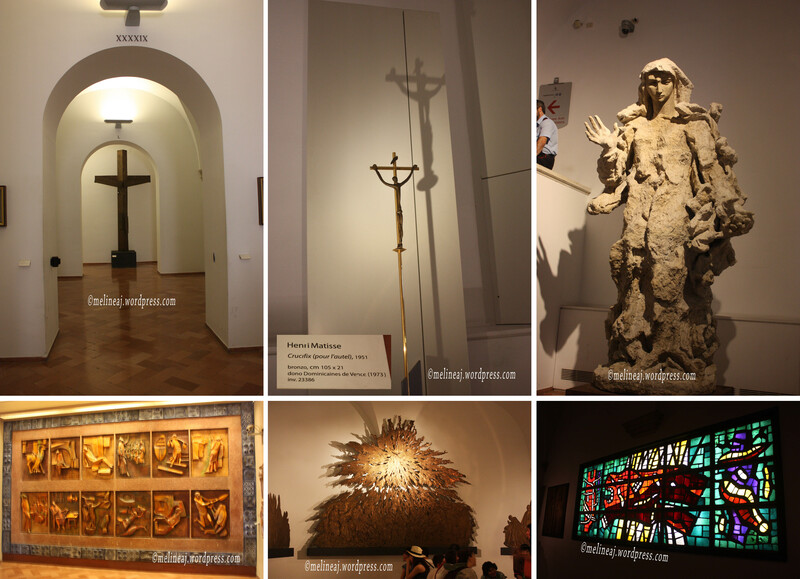 We then continued into Sala Sobieski with beautiful paintings on the wall and Sala dell’Immacolata with frescoes on the walls depicting the Immaculate Conception of Virgin Mary that is believed as one of the dogma in Catholicism. The next section that we explored was Raphael Rooms (Stanze di Raffaelo). Raphael was a very famous Italian painter – as famous as Michelangelo – well… they were the MASTERS during that time period. There are 4 rooms in this section (this order was according to when we walked into each room): Sala di Costantino (“Hall of Constantine”), Stanza di Eliodoro (“Room of Heliodorus”), Stanza della Segnatura (“Room of the Signatura”) and Stanza dell’Incendio del Borgo (“The Room of the Fire in the Borgo”). 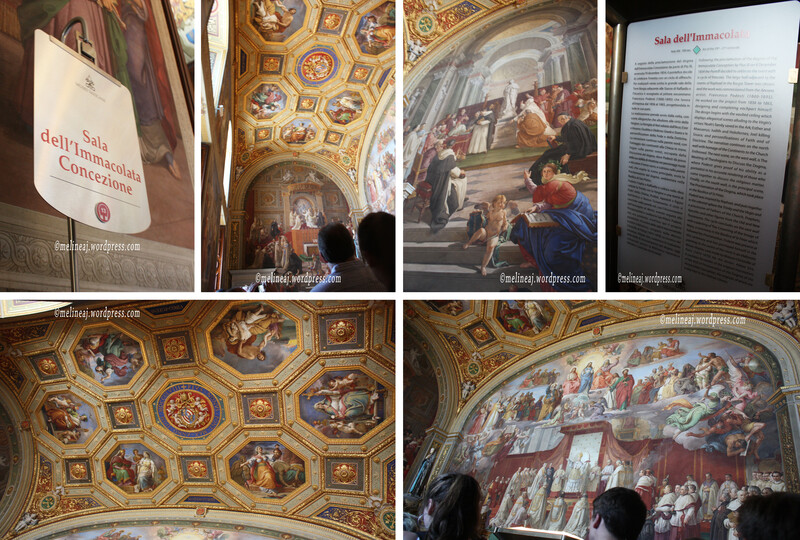 All four rooms showed the AMAZING works of Raphael in every corner! The following area was called Capella di Urbano VIII room. The walls in this room were covered by stamped leather a.k.a. “ancient wallpaper”. According to the description on the sign, the leather functions as decoration as well as insulator of the room during winter time. Prior reaching Borgia Apartments, we entered yet another room with beautiful ceiling above and passed through a hallway with a Vincent Van Gogh’s Pietà showing Virgin Mary mourned after Christ death. 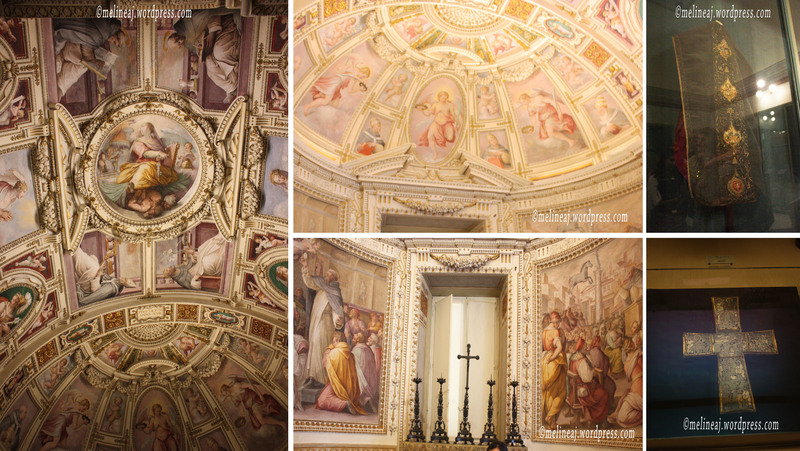 The Borgia Apartments (Appartamento Borgia) are another series of room full of frescoes – and pretty vault – used by Pope Alexandre VI (Cardinal Rodrigo Borgia). During his reign, This controversial pope was suspected to be involved in many crimes, such as adultery, murder, nepotism, etc. Remember the TV show called The Borgias? This fictional series were inspired by Pope Alexandre VI. I extremely love the gold paint outlining the colourful frescoes all around this room. The next area was Collezione Arte Contemporanea where tonnes of modern religious art were kept. The works of many famous artists, such as Vincent Van Gogh, Pablo Picasso, Salvador Dali, and Paul Gauguin, displayed beautifully. However, most of people – including us – seemed not to appreciate the art that much since we rushed to see the famous Sistine Chapel. I wish I had more time to enjoy the painting, sculptures, stained glass, and many other unique form of art in this room. As we walked along, we saw lots of people walking in slower pace .As I suspected, it was because of the most popular site at Vatican Museum, the Sistine Chapel! Prior entering the Chapel, there’s a sign warning people NOT to take any photo and video; as well as NOT wearing shorts and tank top and keep QUIET! Once we were inside, it was like a church mass! So many people with their head looking at the ceiling and adoring the finest works of Michelangelo. Ironic to ‘keep silent’ sign, the Italian guard there spoke loudly on the loud speaker – in the flattest tone possible – shushing whenever people were whispering a little too loud, “Shussshhh… Attenzione! Quiet please! No foto, no video!” However, I saw lots of people tried to sneak some picture with their iPhone or other smartphone but then a lot of security walking around to warn them and maybe tell them to delete the picture (?) Anyhow, if you’re really curious of the Michelangelo’s work on the ceiling of Sistine Chapel, Wikipedia has a general info about each section. 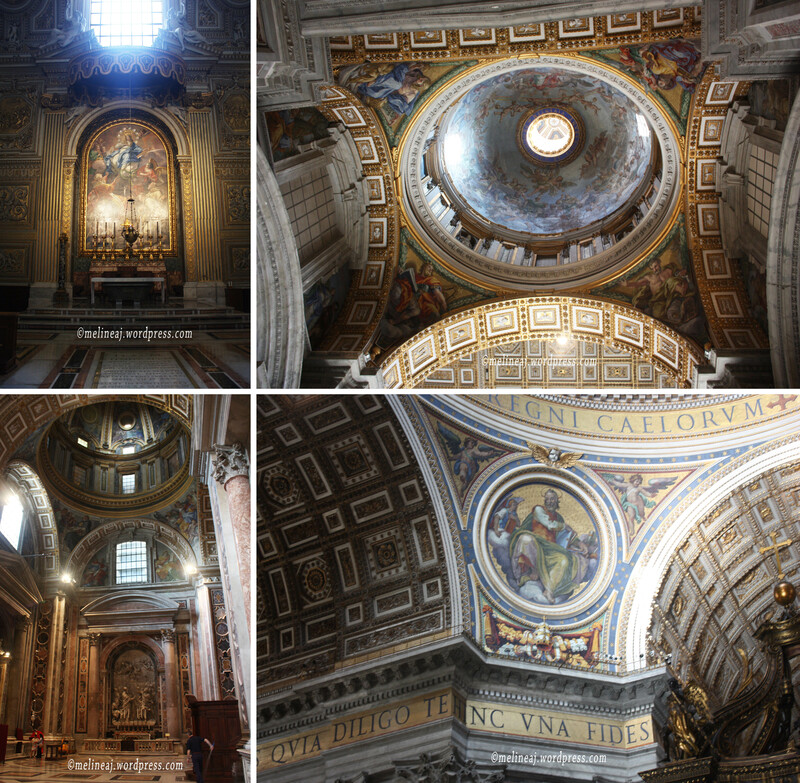 The high ceiling in the chapel create a giant canvas for Michelangelo to work with. Amazingly, when we looked from below, the human figures were in correct proportion. I have no idea how he could paint with the right perspective! To satisfy my curiosity, I did further researches after my trip, I watched a video of Museum Secrets about the secret of Vatican Museum. The video makes me more appreciative toward Michelangelo – as one of the great artists ever! Michelangelo was actually not a painter but he’s a sculptor. His sculptures looked very realistic and real since he had a great understanding about balance and proportion – i.e. the master of 3D! This explains how his painting on the Sistine Chapel ceiling looked so real from below. The more amazing thing is that at one section where the ceiling tilts inside (toward us), Michelangelo painted Jonah who looked to be tilted backward! This obviously requires a great skill to create the reverse illusion! He worked 18 hours a day for 7 days a week non-stop with just few feet away from the ceiling to create his masterpiece that deteriorated his health. His determination and dedication reflected how he was willing to sacrifice life for art! 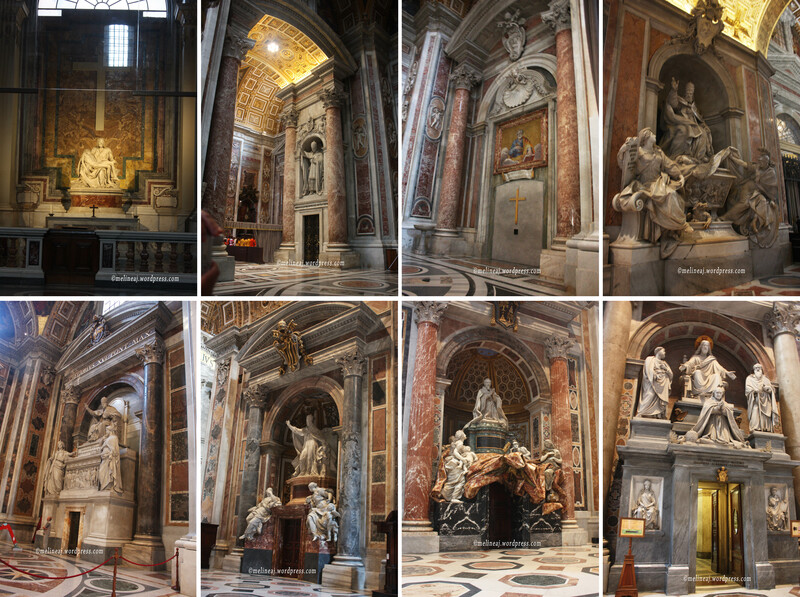 After we finished adoring the Sistine Chapel, we continued our tour to the last part of the museum that houses Vatican artifacts: Capella di San Pietro Martire, Sala degli Indirizzi, Sala delle Nozze Aldobrandine, Sala dei Papiri, and Museo Cristiano. Among the artifacts, one thing that stuck me was the Celestial Globe made by Giovanni Antonio Vanosio. According to the description, this hollow wooden globe depicts the constellations as seen from Northern hemisphere sky. The deep blue colored globe looked very contrast on top of the golden stand. The windows along Museo Cristiano open toward the Vatican Garden. Yes! The one that needs to be booked in advance and ain’t cheap! 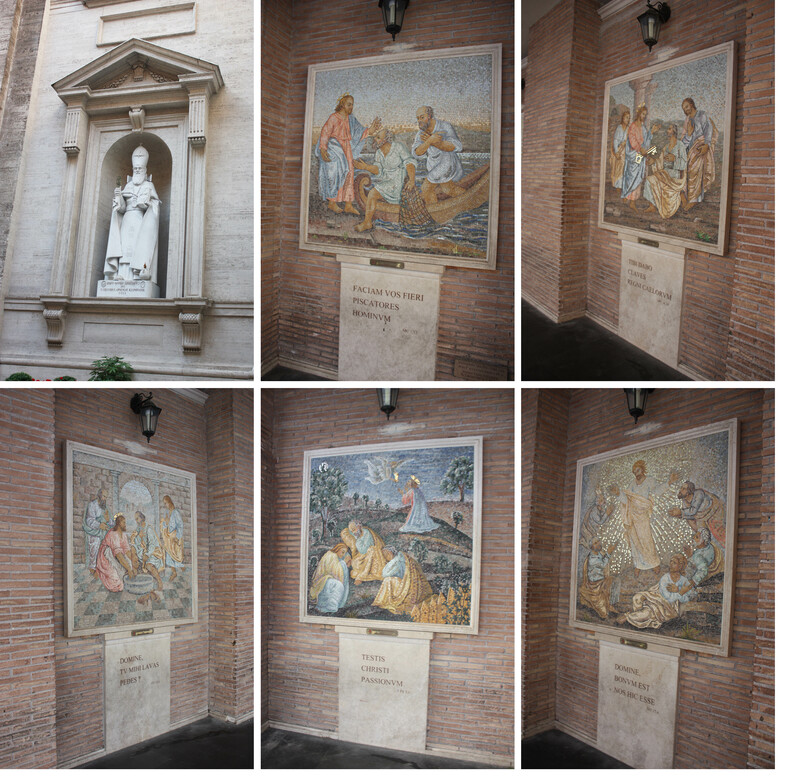 So, yeah if you don’t have time and/or money to spend on Vatican Garden tour, you can have a sneak peek here. There are lots of souvenirs stalls and shops along the museum and the bookstore is available at the end of the tour. By the time we finished the whole 4 hours tours, our legs were just numb. We couldn’t even walk anymore! We sat at one of the sidewalk to regain our strength. 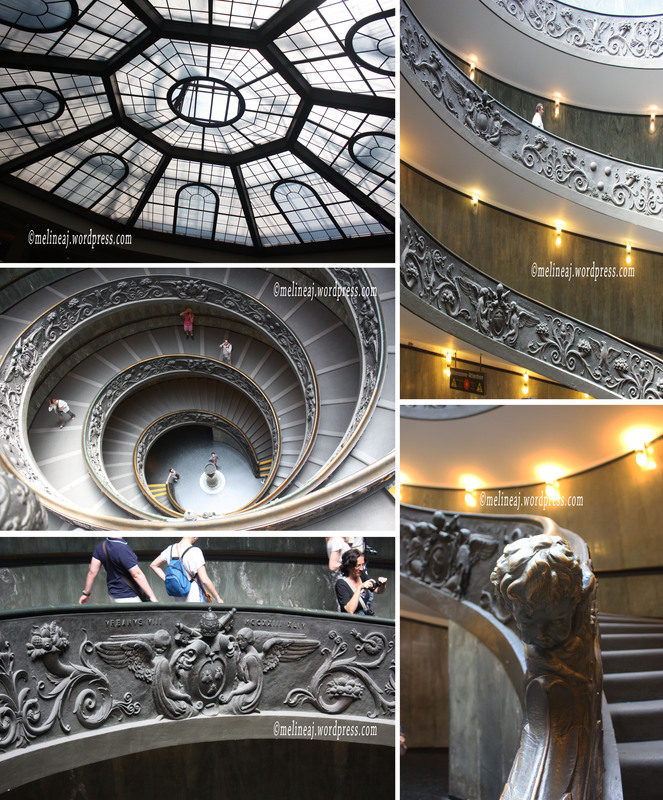 To exit the museum, we had to go down through the famous Momo Spiral Staircase. Our water bottle was empty during the lengthy tour so we looked for a supermarket nearby. There was a Carrefour Express when we walked toward metro station. Here, a bottle of mineral water was only €0.30! Super cheap!!! Next, we headed to Colosseum.